(Scott Sommerdorf | The Salt Lake Tribune) Steven Lund stood by with a gun strapped to his chest as a string of speakers addressed the crowd. A group calling themselves Citizens and Students For Liberty (SFL) gathered at the Utah State Capitol on Saturday to show their support for the Second Amendment, Saturday, April 14, 2018. (Scott Sommerdorf | The Salt Lake Tribune) A group calling themselves Citizens and Students For Liberty (SFL) gathered at the Utah State Capitol on Saturday to show their support for the Second Amendment, Saturday, April 14, 2018. (Scott Sommerdorf | The Salt Lake Tribune) A group calling themselves Citizens and Students For Liberty (SFL) gathered at the Utah State Capitol on Saturday to show their support for the Second Amendment, Saturday, April 14, 2018. (Scott Sommerdorf | The Salt Lake Tribune) Steven Lund stood by with a gun strapped to his chest while Villina Greenwell talked about gun control in Australia as a group calling themselves Citizens and Students For Liberty (SFL) gathered at the Utah State Capitol on Saturday to show their support for the Second Amendment, Saturday, April 14, 2018. (Scott Sommerdorf | The Salt Lake Tribune) Two armed men talk as a group calling themselves Citizens and Students For Liberty (SFL) gathered at the Utah State Capitol on Saturday to show their support for the Second Amendment, Saturday, April 14, 2018. (Scott Sommerdorf | The Salt Lake Tribune) A group calling themselves Citizens and Students For Liberty (SFL) gathered at the Utah State Capitol on Saturday to show their support for the Second Amendment, Saturday, April 14, 2018. (Scott Sommerdorf | The Salt Lake Tribune) A group calling themselves Citizens and Students For Liberty (SFL) gathered at the Utah State Capitol on Saturday to show their support for the Second Amendment, Saturday, April 14, 2018. (Scott Sommerdorf | The Salt Lake Tribune) A man carrying his weapon on his back and leaning on a white cane was part of a group calling themselves Citizens and Students For Liberty (SFL) as they gathered at the Utah State Capitol on Saturday to show their support for the Second Amendment, Saturday, April 14, 2018. (Scott Sommerdorf | The Salt Lake Tribune) A group calling themselves Citizens and Students For Liberty (SFL) gathered at the Utah State Capitol on Saturday to show their support for the Second Amendment, Saturday, April 14, 2018. (Scott Sommerdorf | The Salt Lake Tribune) A group calling themselves Citizens and Students For Liberty (SFL) gathered at the Utah State Capitol on Saturday to show their support for the Second Amendment, Saturday, April 14, 2018. (Scott Sommerdorf | The Salt Lake Tribune) A group calling themselves Citizens and Students For Liberty (SFL) gathered at the Utah State Capitol on Saturday to show their support for the Second Amendment, Saturday, April 14, 2018. (Scott Sommerdorf | The Salt Lake Tribune) A group calling themselves Citizens and Students For Liberty (SFL) gathered at the Utah State Capitol on Saturday to show their support for the Second Amendment, Saturday, April 14, 2018. (Scott Sommerdorf | The Salt Lake Tribune) A group calling themselves Citizens and Students For Liberty (SFL) gathered at the Utah State Capitol on Saturday to show their support for the Second Amendment, Saturday, April 14, 2018. 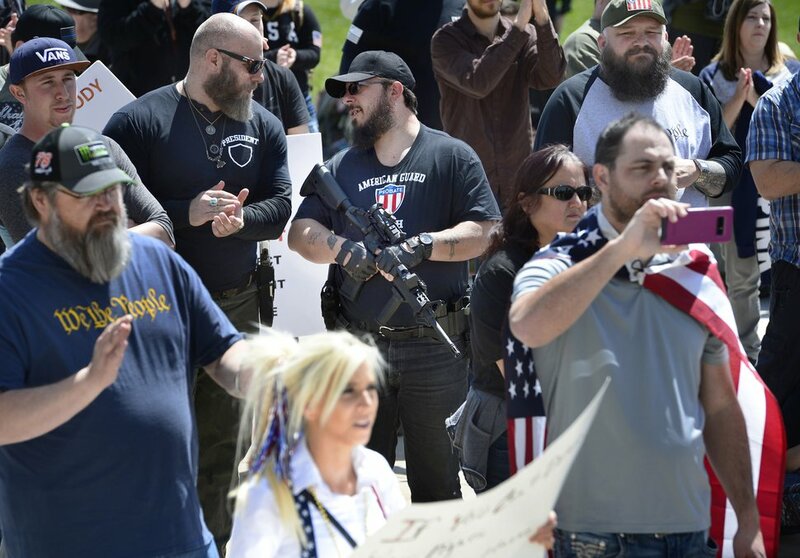 (Scott Sommerdorf | The Salt Lake Tribune) People attending a rally in support of the second amendment raise their hands as a speaker asked who in attendance were carrying firearms. 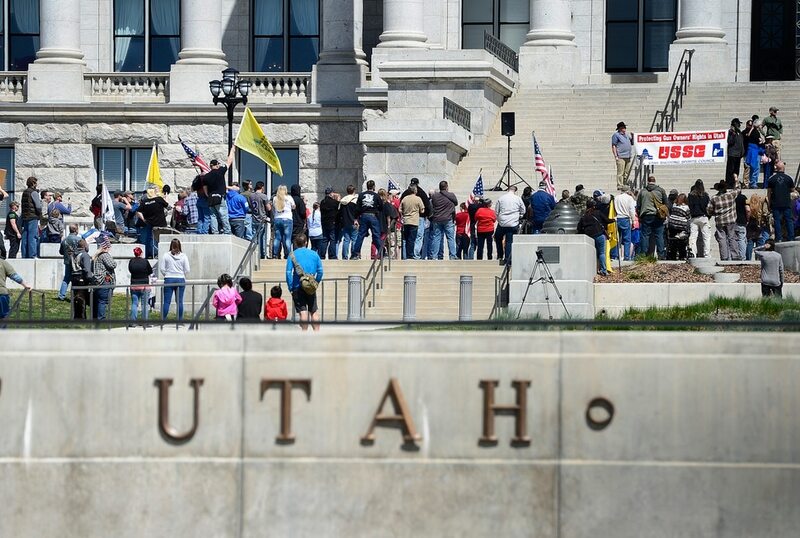 A group calling themselves Citizens and Students For Liberty (SFL) gathered at the Utah State Capitol on Saturday to show their support for the Second Amendment, Saturday, April 14, 2018. (Scott Sommerdorf | The Salt Lake Tribune) A man clutching a flag and carrying a gun listened to speakers as a group calling themselves Citizens and Students For Liberty (SFL) gathered at the Utah State Capitol on Saturday to show their support for the Second Amendment, Saturday, April 14, 2018. (Scott Sommerdorf | The Salt Lake Tribune) A group calling themselves Citizens and Students For Liberty (SFL) gathered at the Utah State Capitol on Saturday to show their support for the Second Amendment, Saturday, April 14, 2018. (Scott Sommerdorf | The Salt Lake Tribune) A group calling themselves Citizens and Students For Liberty (SFL) gathered at the Utah State Capitol on Saturday to show their support for the Second Amendment, Saturday, April 14, 2018. 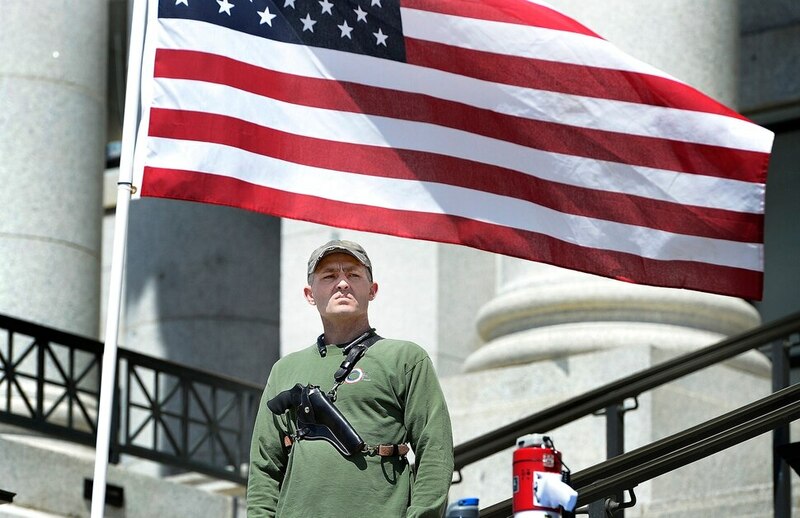 Standing on the Utah Capitol steps, framed by American and yellow Don’t Tread on Me flags, Steven Lund, with a handgun strapped to his chest, asked the hundreds of people standing below if they were willing to let movie stars, politicians and teenagers run their lives by helping to enact gun control. “I’ll buy a ticket,” another yelled. “I’ll buy one, too!” someone else said. Lund, who owns ACE Firearms in West Jordan, was among nearly a dozen speakers at Saturday’s pro-Second Amendment rally who drew a stark line between themselves and those who advocate any kind of gun regulation, which many speakers said was akin to tyranny. The rally came less than a month after thousands of people — and hundreds of counterprotesters — gathered at the Capitol in support of gun control as part of the March For Our Lives campaign. (Scott Sommerdorf | The Salt Lake Tribune) Two armed men talk as a group calling themselves Citizens and Students For Liberty (SFL) gathered at the Utah State Capitol on Saturday to show their support for the Second Amendment, Saturday, April 14, 2018. 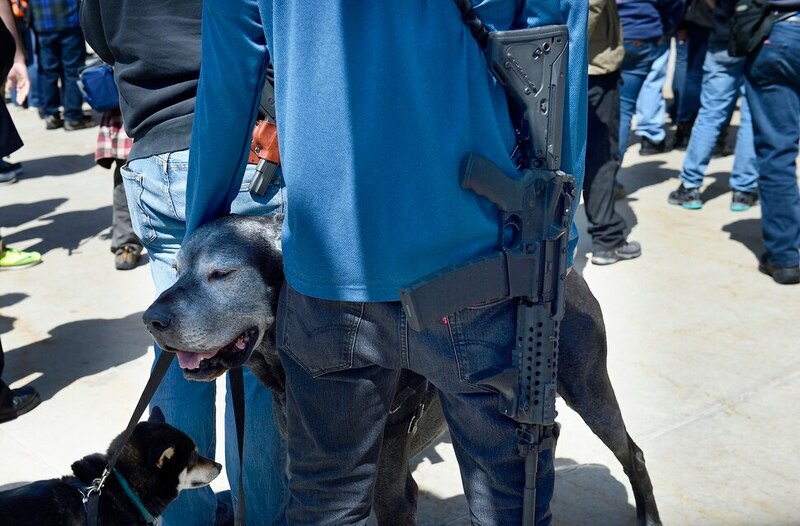 About 300 people, mostly adults, attended the Saturday event, which was held in conjunction with nationwide rallies, including ones in Orem and Cedar City. Many strapped guns and knives to their thighs or waists or slung them over their shoulders. American flags and the yellow Don’t Tread on Me banners dotted the crowd, waving in the gentle breeze. Robert, who organized and emceed the event but declined to give The Salt Lake Tribune his last name, opened the rally by reminding people why they were there: We want to keep the Second Amendment, he said, and we want to keep our guns. If guns are taken away, the Utah Unorganized Constitutional Militia member said, there will be grave consequences. Although recent talk about gun control — especially coming from young people — concerned Robert, one boy — 16-year-old Collin Thorup — gave him hope for the future. Thorup, a student at Hunter High School in West Valley City, told the crowd that he used to base his political opinion on feelings. More recently, he said, he’s started using facts. When he recently preregistered to vote in 2020, he proudly checked the Republican box. On March 14, as his fellow students walked out of the classroom to protest gun violence, Thorup said he was one of three students who stayed behind. Although he has felt ostracized by some of his peers and at least one teacher, and has gotten in some arguments, Thorup said he gets satisfaction in knowing he’s right. Josh Woolsten, also 16, came to the rally with his brother Adam, 22, to show his support for the Second Amendment and to make the point that gun control isn’t the answer to the problem of gun violence and school shootings. Toward the end of the demonstration, Robert took the microphone again and cautioned attendees against compromising on gun regulation. More compromise, he said, means lawmakers will try to take away more rights — and anyone who does that is not a friend, ally or American. Although he conceded he’d rather be at home having a cold drink on the sunny day, he said being at the rally was important.